A fantastic way to help improve your local area is to organise a community clean-up. Havering Council can help you organise a clean-up by providing you with posters to promote you event, clean-up equipment and removal of any rubbish you collect. If you are interested in volunteering for a clean-up, email Kim Smith. Pictured: A community clean-up in Elm Park prepared the town centre for the town’s 80th anniversary celebrations with around 50 bags of rubbish removed. The Friends of Raphael Park is organising a programme of litter picking at the park in Main Road, Gidea Park – do come along and lend a hand. Sunday 20 September, meet at the playground. Nine local community projects this month shared £3,384.12 - money that was donated by residents of the Borough through the London Green Points – Havering scheme. The scheme encourages residents to reduce, reuse and recycle more by rewarding them with ‘Green Points’ depending on how much more recycling and less rubbish is being collected in their community. The projects are 7th Hornchurch Scout Group, Friends of Bedfords Park, Friends of Cottons Park, Harold Hill Food Bank, Havering Family Diabetes Group, Havering Mind, Motorvations, Saint Francis Hospice and the Thames Chase Trust. More information available here. In this hot weather what better prize than an ice cream maker? Paula Young, from Rainham Royals Youth Centre, won an Andrew James ice cream maker simply by sending back a feedback form about the Love Food Hate Waste events she has been running every Thursday. Paula (on the right) is pictured with colleague Samantha Sheen and the ice cream maker. Become a Love Food Hate Waste Champion here. Residents can also claim green points for recycling things at Bring Banks including textiles, glass, paper, cans, plastic bottles and food and drink cartons. Residents are joining forces to tackle dog fouling in their neighbourhoods by setting up Dog Watch schemes. 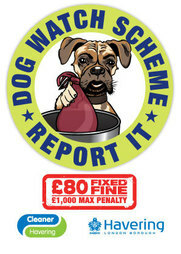 Members of the scheme keep an eye open for dog owners who don’t clean up after their pets, taking photos of offenders (when safe to do so) and letting the Council’s enforcement staff have details of the problem. Around 50 complaints a month are received by the enforcement team and successful prosecutions have been achieved from some of those complaints. Failure to clean up can mean an £80 Fixed Penalty, or up to £1,000 if the case goes to court. If you see a regular dog walker who doesn’t clean up any mess left by their pet you can report them here and Havering Council will follow up your report. Before you can use Havering Council’s online Report It services you need to sign up for a free My Account. Report an abandoned trolley for a chance to win £300′s worth of retail vouchers from Trolleywise. Download the FREE Trolleywise app from here to automatically qualify for our monthly prize draw. Each month Trolleywise contact a winner to receive vouchers from UK retailers. In the average black sack left out for Havering Council to collect 48 per cent is food waste – that is £56 per month being thrown away by each family in the Borough. Havering supports the Love Food Hate Waste campaign, which provides tips, recipes and advice all helping you to reduce food waste and save nearly £700 a year. If you do have waste food a large amount of it can be composted at home. Give and Take Days are on the last Wednesday of every month at Romford Central Library, from 10:30am to 1:30pm. Havering Council is partnering with The Restart Project so residents and community groups can learn how to repair waste electricals and electronic equipment (WEEE). If you would like to learn how to repair electrical items, and help others to repair their own items, at your school or community group, you can register to become a Havering Restart Volunteer Champion. Please submit your request here and we'll get in touch. We are also looking for qualified PAT testers who can help out at our workshops. You can sign up here to be a Restarter Champion. Find out more about electrical waste recycling here. If you live in a house in the Borough, you can recycle your used household batteries by placing them in a small carrier or sandwich bag and putting them out with your orange and black sacks. More information on which batteries can be recycled is available here. Can you be a Havering Green Points Champion? More than 25,000 Havering households have joined the London Green Points – Havering rewards scheme but we want to see even more. That is why we are looking for volunteers to become London Green Points – Havering champions to spread the reduce, reuse, recycle message in their communities. Each champion will receiving training and support as well as gaining extra green points for attending meetings and events. For more information about becoming a champion email Bethany Fruen. Any Havering household can join the London Green Points – Havering scheme here. This update is sent to you because you asked Havering Council for news on Cleaner Havering..
We hope you find this information useful and will encourage friends, family and colleagues to subscribe too. Keep up-to-date with other news from Havering Council by signing up for our email updates then choose the topics that are of interest to you. The full list of email updates currently produced by Havering Council can be seen here. If you have friends, neighbours or colleagues who would find this update useful, please forward this to them and encourage them to sign up. You can also follow us on Twitter @LBofHavering, check out the Havering YouTube channel, see us on Instagram and stay up-to-date with Havering events on our Facebook page.